Abundant grass due to an unusually moist summer has given many farmers plenty of options, and they are making decisions in the livestock market accordingly. 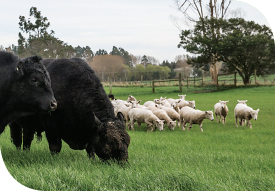 Across most of the North Island, the plentiful feed has caused a slowdown in the supply of sheep and beef stock which, in turn, has driven prices up. Farmers who want to sell will do so at good values and most retain the luxury of choice. As it is likely to be late April before we see any change in the weather, grass will continue to grow and famers will continue to enjoy plenty of options. However, one cloud on this otherwise auspicious horizon for sheep and beef farmers is facial eczema, which thrives in the prevailing warm, humid weather. In those regions where this is most likely to present issues, farmers can mitigate the threat, though need to be proactive about it. Beef cattle prices are similar to last year, while sheep prices have risen by 20 to 30 per cent. March weaner fairs will dominate the cattle market for the next few weeks, with all suggesting similar levels to last year, which was an historic high. For dairy livestock, the dynamics are different. Confidence among some farmers is brittle, persuading them to delay purchase decisions, though they will have no choice but to act before the end of the season. Uncertainty has arisen around the fluctuating Global Dairy Trade results and the Mycoplasma bovis outbreak. In addition, the number of dairy farms on the market is not inspiring confidence. Pregnancy testing and scanning is under way and, with some reports of high empty rates, those farmers who are affected will be making purchasing decisions, looking to Grass good for sheep and beef, though doubt hinders dairy livestock market replace animals. This should bode well for any upcoming clearing sales. Market activity around herds and heifers being signed up on forward contracts will increase as autumn progresses. In late summer, herds were selling between $1600 and $1900 per head and in-calf heifers from $1400 to $1650. Enquiry will continue through the autumn, though the quality of stock on offer is likely to diminish as the season progresses. This report was prepared in consultation with PGG Wrightson’s Livestock team.